If you've ever wondered how to find that quintessential accessory donned by all style-conscious sailors, worry not. One of the many perks of living the life aquatic is the veritable wealth of fashion advice for all things nautical that one acquires without even trying. The sailor's knot bracelet, indeed basic to the accoutrement of any salty dog is steeped in maritime history. 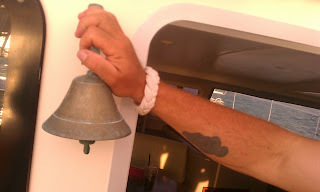 These were not only items of practicality as one could use them to wipe the sweat from one's brow whilst swabbing the deck, but attested to the knot tying prowess of their owner. These days, of course, the preferred way to obtain your own seafaring fashion statement is to purchase one and in my never-ending quest for such necessities, I have discovered several ways of going about it. Doubtless, the most modren way of doing so is to go to sailorknotbracelets.com and simply choose from among their thirty-five styles and colors (34 of which are non-traditional). Lest you be confused, this site also refers to them as " friendship bracelets," presumably because summer camp age children turn them out in droves to give to all of their friends (who are attending the same camp and likewise mass producing them, such that each child by the end of camp has them running up both arms to the pits). To make matters slightly more confusing, they also refer to them as "surfer bracelets" quite obviously because they are cool, like surfers. Whatever you choose to call them, you're certain to find one to suit your style from among the plethora of selections you'll find there. For those who prefer substance (and story) over style, I suggest going to the Wyannie Malone Historial Museum in Hope Town. There on the "bracelet tree" (a twig stuck in a bucket of sand) in the museum's gift shop, is an array of randomly sized bracelets in the one truly traditional color--off whitish. These are handcrafted by some guy named Willie and donated to the museum. I discovered this treasure trove, as it were, only accidentally when I noticed that the proprietor of Da Crazy Crab Souvenir Shop, where I went to buy Cuban Cigars (yeah, that's right), was wearing one and inquired as to where he'd gotten it. If you elect to purchase your sailor's knot bracelet by this latter method, you might actually want to tour the museum as long as you're there. The Wyannie Malone Historical Museum captures the history of settlement on Elbow and the other Abaco Cays, integral to which is the story of The Loyalists--British colonists loyal to King George--who, following the American Revolution left with their slaves and resettled here. (This does much to explain the particular accent of white Bahamians, a blend of Bostonian and South Carolinian to my ear.) The history is a rich one and much time and space are dedicated to the methods by which these Loyalists supported themselves, chief among which was the "wrecking" trade. 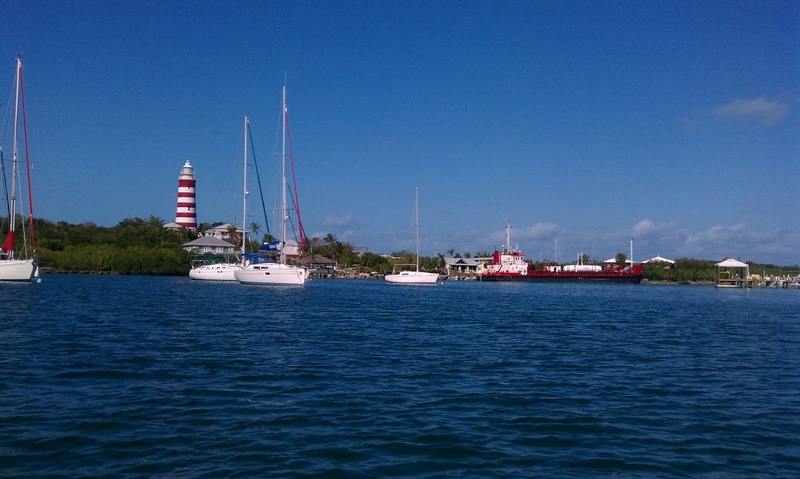 Here, as in the Florida Keys, wrecking was a profitable by-product of the age of tall ships. Without technological advances such as radar, ships sailing at night would not-to-seldom venture too close to a shore and become dashed upon the rocks. "Wreckers" as they were known, quickly and efficiently repurposed the cargoes of these ships by rescuing them (and if not too much trouble, their crews as well) from the sinking ships. One person's plunder is that same person's profit. Lighthouses were the bain of the wrecking industry as they helped navigators steer clear of the very rocks the wreckers depended upon for their livelihood. 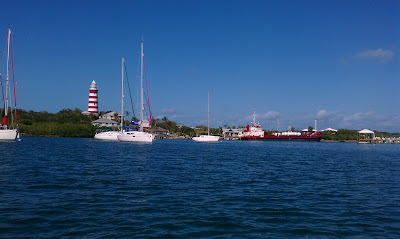 As such, lighthouses like the now-famous candy-striped one on Hope Town were continually vandalized. Eventually, the dictates of commerce made wrecking less profitable and finally more criminal and the wreckers were forced to find other means of making a living. And the Loyalists? One might assume that their descendants would be content to become Bahamians. Many were, but when the Bahamas declared independence from the Crown in 1973, a wave of Bahamian Nationals moved to Australia. So, why on earth, you might ask, as have I, if they insist on maintaining loyalty to Great Britain don't they just move there? Personally, I think it has something to do with the weather.